Tom Skelton, UK comic and improv star, finally gets the chance to put on his favourite Shakespeare play, but he only has one actor (himself), who is registered blind and who might not know all his lines. A fiercely funny farce ensues, as character comedy maverick Skelton presents his unique Tom Skelton’s Macbeth, playing Lazy Susan’s Comedy Den for FRINGE WORLD from Wednesday, January 30 to Monday, February 4 (no show on February 3). Tom Skelton developed Leber’s Hereditary Optic Neuropathy (a genetic eye condition that runs in his family) 10 years ago, leaving him with 5% vision. 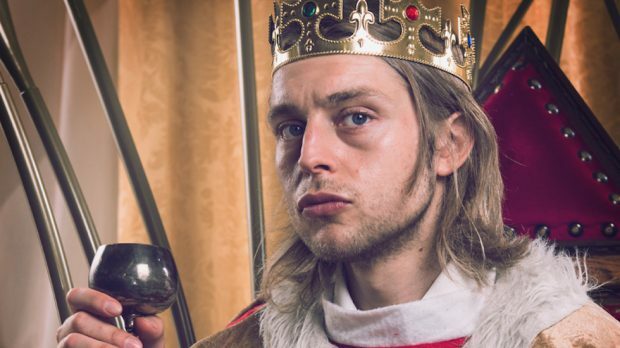 As a result he never thought he would be able to play in his favourite Shakespeare play Macbeth, but now he is starring in its World Premiere at FRINGE 2019. Tom is a character comedian and improviser, who has had four smash hits at Edinburgh: Blind Eye Spy, Blind Man’s Bluff, Foolball and 2061. He stars in Adventures of the Improvised Sherlock Holmes, works with the BAFTA-winning History Bombs and is a founding member of the UK improv comedy group Racing Minds. Tom Skelton can also be seen at FRINGE in: Aaaand Now for MORE Kiddo Kaos!, Improv Allstars Up Late and Did you Hear what I Saw? Tom Skelton’s Macbeth features as part of Lazy Susan’s Comedy Den FRINGE WORLD program from Wednesday, January 30 to Monday, February 4 (no show on February 3) at 8.30pm. Get more info and tickets here.